Hello ribbon lovers. Bonnie here today and I'm sharing another birthday card. I can never keep up with all the birthdays, so I'm trying to build a bit of a 'birthday card stash'. Wish me luck! My card today features my favorite Delicate Stitched Satin Ribbon and one of the new Heart Shaped Dotted Wave Rhinestones from Really Reasonable Ribbon. 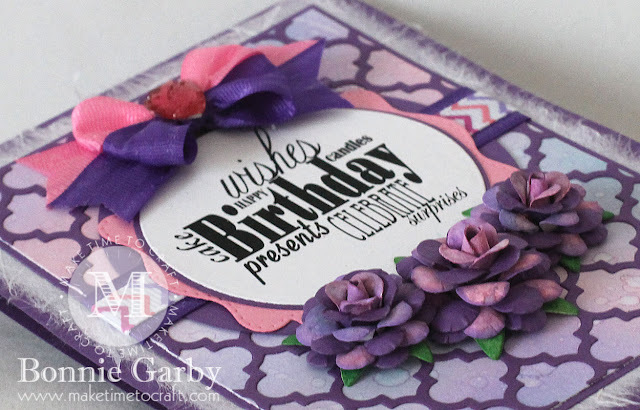 I'm also guest designing this month over on the Crafting by Designs Challenge Blog and the theme this month (June) is 'Anything Goes'. Head on over and link up a project! I'm still playing around with Distress Inks and I'm LOVING them. So much fun! I also added some Distress Oxide Inks on the paper I made for the roses. I wrapped some 5/8" Regal Purple Delicate Stitched Satin Ribbon around the center of my card under the sentiment and topped that with 3/8" Tutti Frutti Chevron Grosgrain Ribbon for some added color. My pretty bi-color bow was made on my Bow-it-All V3.0 tool using 5/8" Hot Pink and Regal Purple Delicate Stitched Satin Ribbon from Really Reasonable Ribbon. I finished off the center of the bow with a pink Heart Shaped Dotted Wave Rhinestone. For a video tutorial on how I made this beautiful bow, please click HERE. Thanks so much for stopping by today. 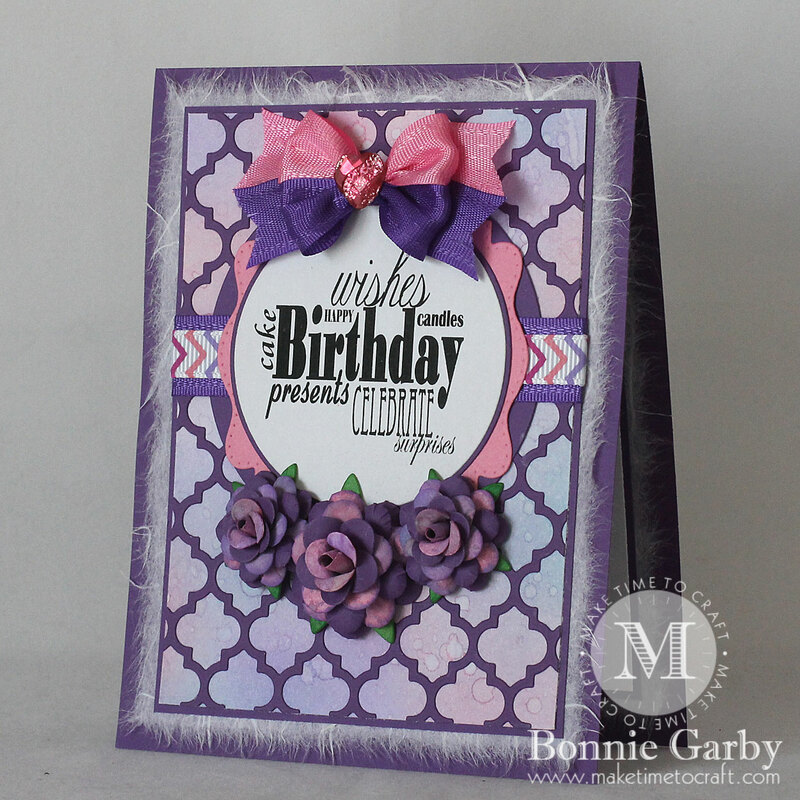 For more information on any of the other products I used on my card, please visit my Make Time to Craft Blog. 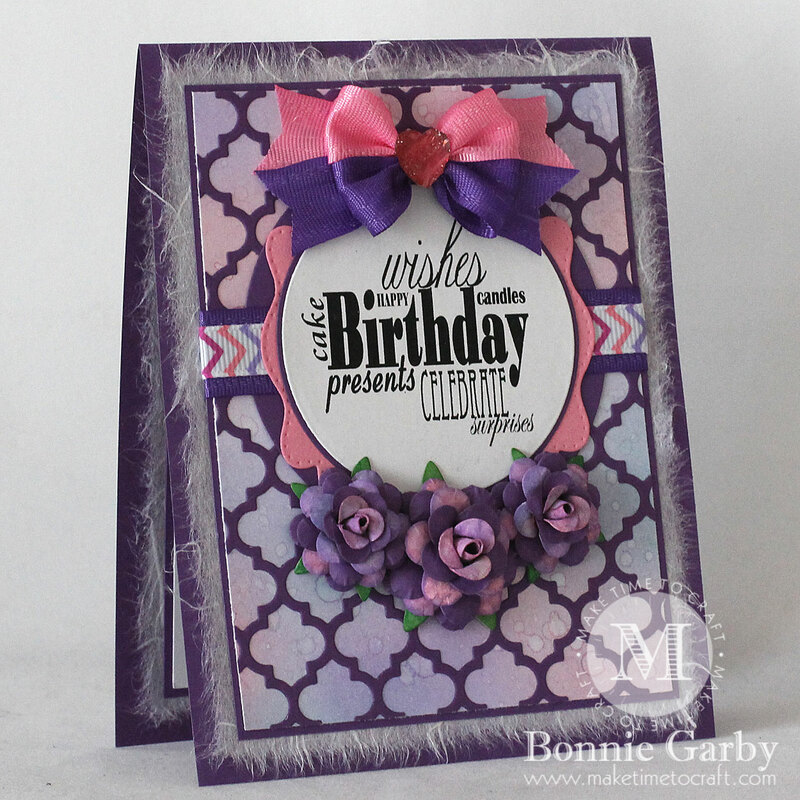 Bonnie, your card is gorgeous! Love those colors. I know what you mean about building your stash.